President Hassan Rohani’s 2013 campaign promised Iranians that within one hundred days of his presidency they will feel the effects of his plan to improve the situation of the country in their everyday lives. 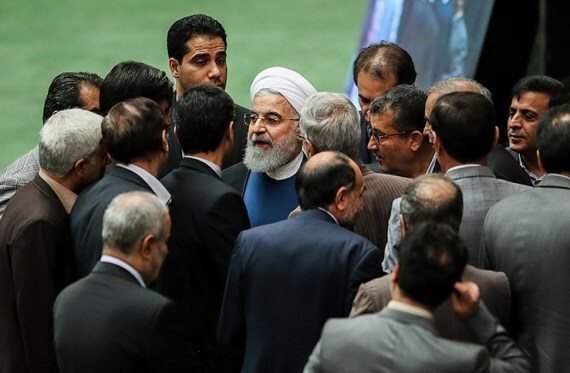 One hundred days after being elected in 2013, Hassan Rouhani, the Iranian president, made an appearance on the state television claiming that he has been successful in delivering on his promises. In his 2017 campaign for presidency, Rouhani made a similar promise and we are rapidly closing in on the deadline and as customary, he will probably make a public appearance to make a similar claim of success. The question remains whether he has truly been able to make any positive changes in his voters’ lives and if the average citizen in Iran feels any improvement in their lives or the situation of the country as a whole. The list of Rohani’s promises is in the hundreds and includes items such as eliminating international sanctions, tackling corruption, creating jobs, controlling inflation, filling leadership positions based on merit rather than nepotism, resolving workers’ problems, ending the house arrest of the opposition leaders, establishing constructive internationally relations, diverting development focus from the capital to provinces, full commitment to the constitution, reinforcement of civil rights, tackling the problem of addiction, succouring the country’s economy, reforming government administration, defending freedom of press and media and pressing for government transparency and social justice among many others. What follows are my field observation of a cross section of Iranians and it throws a shadow of doubt on President Rohani’s claims of success. There has been a 700 percent increase in the price of housing in the past decade. Owning a house is a far-fetched dream for most Iranians. A 45 years old citizen says before you could buy a house with some savings, including with the help from the family and a mortgage, now it is impossible to save and you cannot expect any help from others. A 32 year old labourer says monthly mortgage payments would be equal to his monthly income with no money left for food and other expenses. A young courier says to make the six to eight hundred thousand touman (roughly $200) mortgage payments one has to have two million toumans in monthly income. The traffic police hears the conversation and comments that if you have five children, two million will not suffice. A fifty year old woman adds that without financial support from parents, young people could never buy a house in Tehran. People in the provinces say the situation in the provinces is no better because there are no jobs and the jobs that exist are low pay. Meanwhile the situation of tenants is deteriorating. One third of the country are tenants and do not own their homes. Monthly rents take up to 60 percent of household incomes while housing laws continue to favour landlords’ interests. This has led to the migration of low income families to the peripheries of the cities. Unhealthy nutrition habits is resulting in an epidemic of diabetes, digestive disorders and osteoporosis among Iranians. There has been a sharp spike in the consumption of high sugar and starch content foods in all strata of the society. High fat meats, at lower prices are in high demand to remedy household expense shortages. Protein is disappearing from average diets as a labourer earning 1.2 million toumans ($230) and an engineer earning 2.6 million toumans ($750) a month report buying only one to two kilograms of meat each week. A young woman reporting a combined household income of 2.3 million ($660) toumans a month says she looks up vegetarian dishes online or makes them up in order to save on food expenses. Corruption in government offices remains a major concern. The press is restricted more and more each day. Independent websites and other media are restricted by censorship.The economy shows no sign of recovery as the exchange rate for the dollar is increasing by the day. The brain drain continues while the country continues to be viewed as high risk for international investment. Labour protests continue all across the country due to non-payment of wages and plant shutdowns. In response protesters are arrested and prosecuted. Hope that reforms could be effected through the election process is gradually corroding as people feel all open doors for legal political activism are being closed. Other young people admit to joining discussions on the messaging app Telegram. Others speak of a deep ennui regarding the prospect of any political change and say they prefer to use gatherings to forget the dire situation of the country. Meanwhile President Rohani insists that he is on track with his promises. His proof? His policies have resolved the housing problems of the country, pulled the economy out its slump, mended relations with the international community and reinforced civil rights for Iranians – or so he says.